For forward-thinking businesses striving to accelerate their digital strategies, finding an IT partner to manage user ready IT, including traditional tech enablement and support, prepares the business for peak performance. Businesses require IT partners to deploy technologies and minimize risk. By contracting out this work, internal IT staff can focus on strategy and improvement, communication and security. Think of the data you collect as a story that’s being uncovered. What stories are your metrics trying to tell you about your business? And is your IT partner measuring up? Analytics do not mean much until you tie them to something that matters. If metrics are your business story, engagements are your relationships with people. Defining engagement goals and metrics are key to informing and shaping your long-term strategy and success with your ideal IT partner. You have the power to determine how successful your business is. Define and measure your key business goals based on past experience and industry standards. The metrics you use to measure these goals should address specific needs and provide relevant data that offer insights and advance your overall strategy. 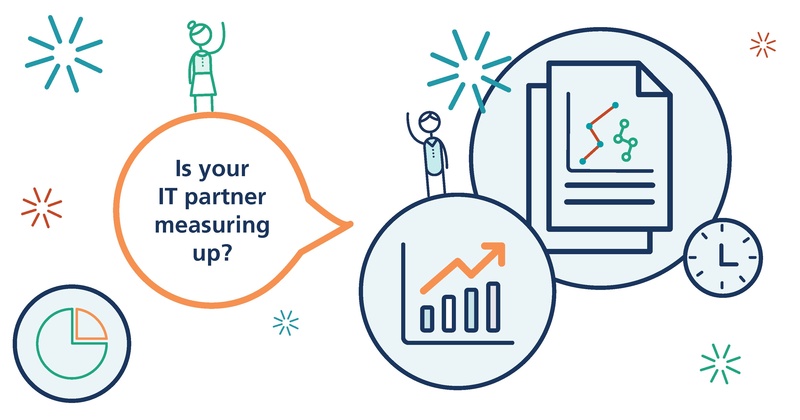 Defining engagement goals and measuring metrics can help you and your ideal IT partner better understand how to allocate resources in order to meet your objectives. Begin by defining and establishing the bottom line goal that supports your long-term strategy. At its core, what is it you’re really trying to accomplish through your metrics? Take the time to do some research. Consider the goal to be tied to a numerical value so there’s a tangible measurement to work toward. Identify the objectives that ultimately lead to your bottom line goal. Your IT partner can envision how the objectives tie in with your bigger strategy. Additionally, develop a shared timeline with specific deadlines that help you stay on track and enable you to measure results over a given period of time. Doing so creates structure and provides a sense of purpose as you work with your ideal IT partner in reaching your company’s overarching goal. An ideal IT partner knows your business well enough to understand what goals and metrics are useful, and instills trust that they will help you best meet your bottom-line business goal. Ask the following questions: What does success look like? Are the goals and metrics realistic and attainable or are they over ambitious and setting you up for failure? How are engagement goals and metrics measured against ROI? Be realistic. If you are achieving a 100 percent success rate, your goals may not be challenging enough. On the other hand, if you aren't anywhere near to achieving your goals, you may have set the bar too high. An ideal IT partner can help you set goals that appropriately challenge you without being entirely unattainable. Be open to improving your process by learning from mistakes and finding innovative solutions. Your company’s engagement goals and metrics do not need to be set in stone, but should merely be seen as guides. Be flexible to amending them as needed over time, and this flexibility will be mutually beneficial.